After over 12 years of not sleeping, these two women set out on a mission to find a way that actually works out of their own desperation. They found that secret and are now determined to help others get their sleep back as well. 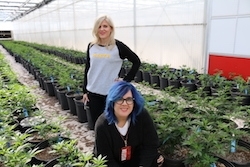 St. Louis, MO, March 12, 2019 --(PR.com)-- Treeline Organics, a woman-owned business, just launched their first of many CBD oil products, Epic 1.0 Sleep Spray. Epic 1.0, a sleep spray made from high quality, natural and toxic-free ingredients including Whole Hemp Extract (CBD). With Sleep Awareness week upon us, this is the perfect time to introduce you to Treeline Organics, a woman-owned company that recently launched the most epic sleep spray to date, Epic 1.0. This is an entirely new way for consumers to get the much-needed sleep they desire. This product delivers a deeper, more restful sleep without the morning after grogginess side effect associated with other sleep aids. The innovative spray bottle packaging makes Epic 1.0 very easy to use and eliminates spilling. Simply spray the great tasting product under your tongue for a restful night's sleep. Epic 1.0 is Treeline Organic’s most powerful sleep spray to date. It’s fast acting, made using nano-technology for better absorption in the body. Epic 1.0 has only the highest quality, 100% natural, toxic free, ingredients such as Valerian Root, Magnesium, Melatonin, GABA and Whole Hemp Extract to help the body relax and ensure a restful night’s sleep. It has been third party tested multiple times throughout the manufacturing process to ensure it meets the Treeline standards. Treeline Organics was founded in July 2018 by Angeles Jonske and Denise Rinehart to improve people’s lives by giving them the best night’s sleep night after night without the morning after grogginess or hurtful ingredients. Treeline Organics ships their Whole Hemp Extract product all across the United States. Treeline Organics is trusted because of the care and standards used.